For those who are cycling the 94.7 cycle challenge in November 2013, why not ride for a purpose? 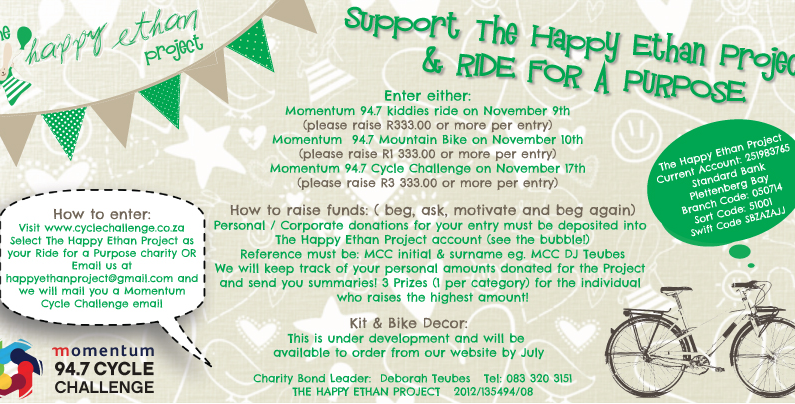 We have collaborated with our friends at The Happy Ethan Project who will be entering a charity team. Whether your child is riding the kiddies race (R333 to be raised), you riding the mountain bike race (R1 333 to be raised) or your friend riding the road race (R3 333 to be raised) do so for a PURPOSE. If my 14 month old daughter can do the 800m race on her trike, anyone can…….